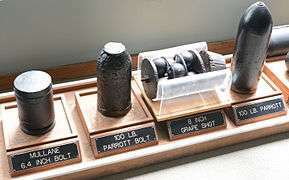 In artillery, grapeshot is a type of shot that is not one solid element, but a mass of small metal balls or slugs packed tightly into a canvas bag. It was used both in land and naval warfare. When assembled, the balls resembled a cluster of grapes, hence the name. On firing, the balls spread out from the muzzle, giving an effect similar to a giant shotgun. Grapeshot was devastatingly effective against massed infantry at short range. It was used to savage massed infantry charges quickly. Cannons would fire solid shot to attack enemy artillery and troops at longer range and switch to grape when they or nearby troops were charged. 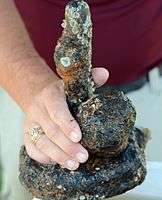 When used in naval warfare, grapeshot served a dual purpose. First, it continued its role as an anti-personnel projectile. However, the effect was diminished due to a large portion of the crew being below decks and the addition of hammock netting in iron brackets intended to slow or stop smaller shot. Second, the balls were cast large enough to cut rigging, destroy spars and blocks, and puncture multiple sails. Canister shot, also known as case shot, was packaged in a tin or brass container, possibly guided by a wooden sabot. Canister balls did not have to punch through the wooden hull of a ship, so they were smaller and more numerous. The later shrapnel shell was similar, but with a much greater range. Scattershot is an improvised form of grapeshot that uses chain links, nails, shards of glass, rocks or other similar objects as the projectiles. Although scattershot can be cheaply made, it is less effective than grapeshot due to the lack of uniformity in the projectiles' mass, shape, material, and resultant ballistics. Field-expedient claymore mines, consisting of a container, projectiles such as ball bearings or used ammo links arranged to project in one general direction, and explosives, are often called grapeshot. Hussite Wars: Grapeshot was used in cannons and hand cannons (píšťala). The noted pirate Bartholomew Roberts (popularly known as "Black Bart") was killed by a blast of grapeshot from HMS Swallow on February 10, 1722. Battle of the Plains of Abraham (1759): Marquis Louis-Joseph de Montcalm was mortally wounded in the abdomen by grapeshot. Kazimierz Pułaski was injured, and later died, from a grapeshot-inflicted wound in the Battle of Savannah during the American Revolutionary War. Battle of Guilford Court House (1781): Cornwallis ordered two grapeshots to be fired into the middle of a battlefield where hand-to-hand combat between the British and Continental Army was taking place. 13 Vendémiaire: Napoleon, then a brigadier general during the later stages of the French Revolution, famously dispersed a Royalist mob on the streets of Paris with a "whiff of grapeshot" on 5 October 1795. He was rewarded with the command of the Army of Italy in 1796, and his victories at the battles of Lodi, Castiglione, Arcola and Rivoli provided a springboard for his military and political ambitions. During the Haitian Revolution, grapeshot was used by French troops against the victorious troops of Toussaint Louverture. During the Irish Rebellion of 1798, grapeshot was widely used by British forces against Irish forces, notably in the battles of New Ross, Arklow, Saintfield and Vinegar Hill. At the Battle of Vinegar Hill, the British used grapeshot to kill hundreds of routed Irish rebels. British commander Sir Edward Pakenham was fatally wounded while on horseback by grapeshot fired from the earthworks during the Battle of New Orleans. Battle of Waterloo (1815): The Earl of Uxbridge was hit in the leg by French grapeshot, the leg was amputated, and he was commended for the injuries he sustained and his bravery in the battle. In Victor Hugo's novel Les Misérables, grapeshot was the weapon used against the barricades in the 1832 insurrection in Paris. During the Battle of Buena Vista (Mexican–American War) in 1847, General Zachary Taylor effectively employed a double load of grapeshot for his artillery in defeating a numerically superior Mexican army led by Santa Anna. His famous order "double shot your guns and give them hell" became the campaign slogan that later won him the US presidency. At the Battle of Gettysburg during the American Civil War in 1863, Union forces effectively used canister shot in repulsing the massed Confederate advance known as Pickett's Charge, a key stage in the battle. Battle of Kalauao: John Kendrick was accidentally killed when the British ship Jackel returned a thirteen-gun salute; one of her cannons was loaded with grapeshot. Revolutionary War: Though they did not have the required resources for typical grapeshot, any small piece of metal was rammed down the barrel and fired at once; this method is known as scatter shot. ↑ Old Humphrey (1799). The old sea captain. p. 227. ↑ Charles Gerard Davis (1984). American Sailing Ships: Their Plans and History. p. 109. ↑ Henry Burchstead Skinner (1853). The Book of Indian Battles from the Landing of the Pilgrims to King Philips War. p. 141. ↑ Martin, Tyrone G (1987). "Isaac Hull's Victory Revisited". American Neptune. Wikimedia Commons has media related to Grapeshot.